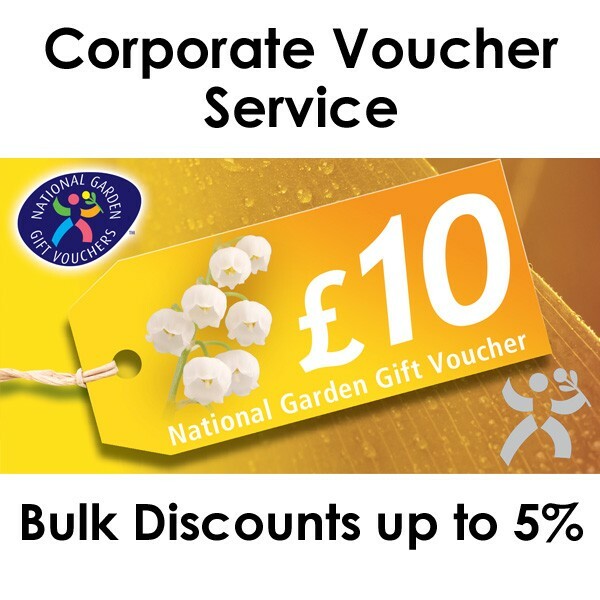 Corporate National Garden Gift Vouchers for Business Incentives and Rewards. 3% BULK DISCOUNT on all business orders over £500. 4% BULK DISCOUNT on all business orders over £1000. 5% BULK DISCOUNT on all business orders over £2000. This discount is applied automatically. We can also post them direct to the recipient. Please email info@homeandgardencentre.co.uk if your company would prefer to pay by BACS, we can then send you a pro-forma invoice. You receive a Free Card Wallet for your Vouchers, below are the available options, select your card in the dropdown above. All Corporate National Garden Gift Vouchers are sent by Special Delivery Next Day and need to be signed for on delivery. This method offers guaranteed delivery of your vouchers before 1.00pm the next working day, and insurance. Cut off time for next day delivery is 2pm. Any orders placed after 2pm on Friday will be dispatched the following Monday (excluding bank holidays). If there is no-one available to sign for the National Garden Gift Voucher(s) on arrival, a card will be left by the postman informing the occupant that an attempted delivery was made. The Gift Vouchers will then be taken to the local Royal Mail Enquiry Office, where they will await collection by the recipient. A suitable form of identification (such as a utilities bill bearing the relevant address) may be required when collecting Gift Vouchers. Should your National Garden Voucher(s) not be collected within 14 days, Royal Mail will return the vouchers to us at which point we will endeavour to contact you to arrange a suitable alternative delivery address and date of delivery. We can deliver to addresses all across the UK including the Channel Islands and Scottish Isles. Dispatch of National Garden Gift Vouchers is from mainland UK - please allow extra time for your order to arrive if sending to any of the areas listed above. Unfortunately we do not deliver anywhere else. National Garden Gift Vouchers are accepted at over 2000 UK garden centres, shops and nurseries. They are the perfect gift for green fingered friends and family. National Garden Gift Vouchers are the only specific gardening gift voucher that can be bought and redeemed throughout the UK. We can even post them direct to the recipient. National Garden Gift Vouchers are operated by The Horticultural Trades Association (HTA) established in 1899, and are the most widely used gardening voucher in the UK. A National Garden Gift Voucher is a great gift for any occasion, and whether the recipient is an experienced gardener, or just starting out, they'll be able to buy everything they need, with a choice of over 90,000 garden products.